Mike Brearley ranks as one of England’s greatest cricket captains, his reputation enhanced by his dramatic return to the Test team against Australia in 1981, and his brilliant captaincy which helped turn near-certain defeat into acclaimed victory in two successive matches, enabling England to retain the Ashes. In old age, Brearley remains an ironic figure, the benchmark by which successive England captains have been judged, but his career was no predestined routs to success. There were considerable pitfalls along the way. In some ways Brearley was a victim of his wide-ranging talents. A scholar and sportsman of some repute at City of London School and St John’s College, Cambridge, he was selected as a young 22-year-old to tour South Africa with MCC in 1964-65. His failure on that tour helped convince him that his future career lay in academia and for six years between 1965 and 1971 he was lost to full-time cricket, very much to the detriment of his batting. It was the challenge of captaining Middlesex that lured him back into first-class cricket, and while this book focuses on his struggle with the senior players as he introduced fresh ideas, his steeliness won through in the end. Middlesex were crowned county champions in 1976 and they continued to dominate throughout the rest of Brearley’s career. 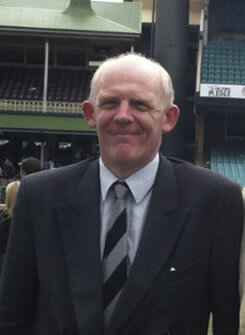 His powers of leadership helped win the vice-captaincy on MCC’s tour to India in 1976-77, and when Tony Greig lost the captaincy because of his involvement with Kerry Packer’s World Series Cricket in 1977, Brearley was the obvious replacement. He proved an immediate success with a 3-0 defeat of Australia but his further success was tempered by his repeated failures with the bat, which placed undue pressure on him to resign. The fact that he survived goes to the heart of this book. What was it about him that made Brearley such an exceptional leader? The book also looks at the great influence Brearley’s father, Horace, wielded upon him, in addition to Brearley’s contribution to the anti-apartheid movement, his work as one of Britain’s leading psychoanalysts, and his legacy as MCC president and chairman of the World Cricket Committee. After Harrow and Edinburgh where he read History, Mark Peel taught History and Politics at Fettes between 1983-2007.A keen biographer, his first book, England Expects: A Life of Ken Barrington, was published in 1992 and won the Cricket Society's Literary Award for the best cricket book of the year.He followed this with biographies of the England cricketers, Colin Milburn and Colin Cowdrey, the maverick headmaster, Anthony Chevenix Trench, the Methodist minister and pacifist, Donald Soper, and more recently the former Labour minister and co-founder of the SDP, Shirley Williams.